In a culture in which all truth is relative and there are no absolutes, what does it mean to trust in God’s Word? Do we really believe that such ancient texts have meaning for us today? How can we get the most from God’s Word? In Why Believe the Bible? 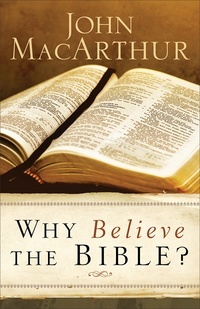 esteemed Bible teacher John MacArthur examines these and other questions regarding the authority, infallibility, and trustworthiness of the Word of God. Whether you are a new Christian or just want to brush up on some of the basic truths of Scripture, this book will give you confidence in the power of God’s Word to transform your life … and show you that the Bible does make a difference! This book includes a Bible reading plan, a new preface, and helpful tools and resources for studying the Bible.